Image: Core Star Energy, located between the navel point and the bottom of the rib cage: http://www.shilamoa.com/images/corestar.jpg .. According to Amara Tia Ann, (1) the Core Star is in the center or core of the body, about 1 or 1 ½ inches above the navel, and lies on the Hara line (see section below). She characterizes the Core Star, to paraphrase, as the physical body’s essence, which is the source of the body’s energy of light. This is the place where we connect to God’s light; the individualized Light of God, the I Am presence of the indwelling God. Last night I began to imagine the Core Star as being in the same location, vertically speaking, but located right next to my spine rather than in the middle of my gut. 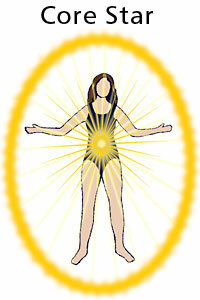 Maybe this is the location of a ‘Hidden’ Core Star, similar to the ‘Hridaya’ or hidden inner heart chakra (see below) . At any rate, the moment I visualized a point on a plane with the Core Star, but right next to the spine, a brilliant light exploded in my head, dazzling my mind and uplifting my heart. The results of this visualization were so stunning that I thought I’d best mention it. As with meditations where one places awareness on the pineal gland in the middle of the head, at eyebrow level … the world ‘stops’ – becomes two-dimensional, with no depth. But with the Core Star Visualization, frontal lobe involvement is even more diminished. I can see with my eyes, but I don’t really connect what I see with my chatterbox mind. I feel freedom from the demands of my body, relaxed. I felt a release of tension from the body. Video: Handel’s “Messiah” – the Hallelujah chorus, http://www.youtube.com/watch?v=76RrdwElnTU .. It feels as if the physical body hologram might flower out from the core star, and might be able to fold back into that spot, into a tight, extremely tiny little bud that can carry all the info needed to reform the body. I know this sounds far-fetched. The Hara Line is a zero-point field of energy with no magnetic polarity. It lies deeper than the chakras, and is characterized by deep calm. Barbara Ann Brennan [who did ground-breaking work on visualization of human chakras, and on energy healing] characterized the Hara line as a solid pole that connects to the sky and to the center of earth. This Hara line has to do with the task our Soul undertakes in this incarnation. It’s the foundation of the energy field of human beings. Image: “Chakras,” author GifTagger assumed, from Wikimedia … public domain … In this image, the Third Chakra (aka Navel Point, Solar Plexus or Manipura Chakra) is the chakra indicated by the yellow circle in the above image, at the level of the navel point. The two very important glands described above, the pineal and the pituitary, are situated physically close to each other, and the one is slightly above the other. Somewhat similarly, I noticed two points on the spine that are situated physically close to each other, and one is slightly above the other. There is the ‘hidden’ Core Star, as described above, and then there is a point slightly lower, and also right next to the spine. This second point I associate more with astral functions. I term it the ‘hidden’ third chakra. Concentrating on this point attenuates (and I expect, will eventually sever) astral cords connected to the navel point. I get this ‘hidden’ navel point energy is a source of great physical strength, as well as physical balance, and timing. I also felt courage – no fear; consequently, heightened reflexes. Video: Ping Pong with Nunchucks -Bruce Lee, http://www.youtube.com/watch?v=isrglsTqgyE ..
develop athletic ability, such as in martial arts or Olympics skills. Finally, it feels like this lower point is the will power control center of the vital body. It puts my will power in the driver’s seat. Here is another, relatively well known case of a ‘hidden’ chakra: The Hridaya Chakra … aka the ‘hidden’ heart chakra or the inner cave of the heart … is located at the level of the heart chakra, but situated deep inside the body, just in front of the spine — to activate our Soul power, to purify, complete, and align our incarnations and our past and present karmic relationships, and further our soul purpose. So in this pairing of energy centers, the heart chakra is the center and source of our human electromagnetic field; and the ‘hidden’ heart chakra activates Soul power. Here is an interesting image of a Hridaya Mudra, or finger pose, using two hands at the level of the core star: http://www.georginapeard.com/sites/georginapeard.com/files/images/Hridaya%20mudra.preview.jpg ..
Well, dear friends, I expect this will be more than enough of an explanation. (1) Link: “Core Star Chakra – The I AM Presence’ Energy Vortex,” posted on 7 September 2012 by Amara Tia Ann at ACAST.Me, http://acastdotme.wordpress.com/2012/09/07/core-star-chakra-the-i-am-presence-energy-vortex/ ..
(2) This concept of ‘individualization’ is from the School of Theosophy. (3) See Link: Amara Tia Ann, ACAST.me, https://acastdotme.wordpress.com/author/alephcast/ … Search the term: The Hara Dimension and The Core Star .. This entry was posted in 02 – Etheric body / vital body / pranic body, 3rd chakra - navel point, 4th chakra - heart chakra, 6th chakra - third-eye point, 7th chakra - crown chakra, Astral cords, Endocrine system, Free will - will power, Grounding - earthing, Hridaya, Meditations - visualizations, Mudras and kriyas, School of Theosophy, Soul wounding - soul clearing - core star energy, Yoga and tagged Amara Tia Ann, Astral cords, Core Star, core star chakra, core star energy, crown chakra, Endocrine system, grounding, hara line, heart chakra, hridaya chakra, hridaya mudra, individualization, JScambio, navel point, psychic cords, soul wounding, Theosophy, third chakra, third eye-point, visualization, Vital body, will power, Yoga on 3 April 2013 by Alice B. Clagett.